GROUNDED IN TRADITION, DRIVEN TO RE-INVENT IT. Alta Cedar Shorthorns was founded in 1953 by W.J. (Bill) Boake. From the start, the Alta Cedar breeding program was carefully developed from within the herd’s elite cow families and intensely bred for consistency. The cow herd grew to a collection of unparalleled productive cow families from which the majority of the herd today are descendant’s. The prefix “Alta Cedar” soon became synonymous with herd bull power, and breed-building females. Alta Cedar quickly grew to have broad purebred and commercial acceptance, bulls and seedstock were sought after from across the country. The Alta Cedar name continues in the pedigree of many successful Shorthorn breeding cattle. Alta Cedar has been, and will continue to be, a source for superior Shorthorn seedstock. Throughout the last six decades, bulls and females bred by Alta Cedar have helped improve and add profit for herds in North America, as well as around the globe. Rich in livestock and Shorthorn history, the Alta Cedar farm is proudly carried forward by Bill’s grandson Peter whose inherent talent and proficient management have grown to be an integral component of the Alta Cedar program. Peter, along with his wife Christine, have always believed in staying true to Bill’s basic principles of cattle breeding. The philosophy Bill relied on to establish the Alta Cedar herd all those years ago, is proving to be just as significant today. Our long term devotion to that process has resulted in cattle that we believe are unique. Years of focusing intensely on influential cow families and very strict culling have provided us with one of the most uniform, performance driven, maternally powerful cowherds you’ll find anywhere! Our cowherd is key to the consistent pen of bulls we sell year after year. We have produced a cowherd that adds consistency and predictability to each and every calf crop. Under the fierce direction and devotion of the current generation, the Alta Cedar name will endure. Quality, consistency and multiple trait selection have always been the cornerstone of our breeding philosophy. Never forgetting the importance of cow families continue to be the main focus. A genuine love and dedication to Shorthorn cattle will always be a tradition. We believe in the strength of the mama cow. We believe in easy fleshing, low maintenance cattle. We believe in not getting caught up in the latest fads. We believe in staying true to what has brought us to this point. We believe in breeding cattle based on multiple trait selection. We believe Shorthorns are a maternal breed... not terminal. We believe strong maternal traits build cowherds, and produce influential herd sires. W.J. (Bill) Boake began his dedication to the Shorthorn breed at a very early age. Bill's father E.J.C. Boake purchased his first registered Shorthorns in 1916, after a barn fire wiped out his dairy herd of Jersey's. Working closely alongside his father, Bill was instilled with the ability and knowledge to produce the best Shorthorn cattle possible. Bill has been producing and showing Shorthorn's for over 6 decades. In 1953, shortly after the untimely death of his father, Bill ventured off on his own and purchased 6 quarters of land directly west of the original Boake homestead. 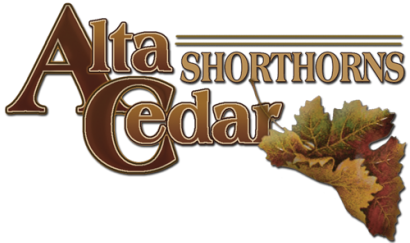 It was there that Alta Cedar Shorthorns was born. The bulk of our cow herd today are descendants of those original foundation females that Bill built his herd around. Building upon select cow families has offered greater consistency and proven production.